When fall rolls around each year here in Kalamazoo and Grand Rapids, for many people with backyard ponds and other water features, it means its time to shut it all down. But a pond or other water feature can be a very attractive winter garden, with the right preparation. Running your water feature during the winter months generally means no ice, and also means no draining of water lines (water lines can expand with freezing and then break if not drained correctly). 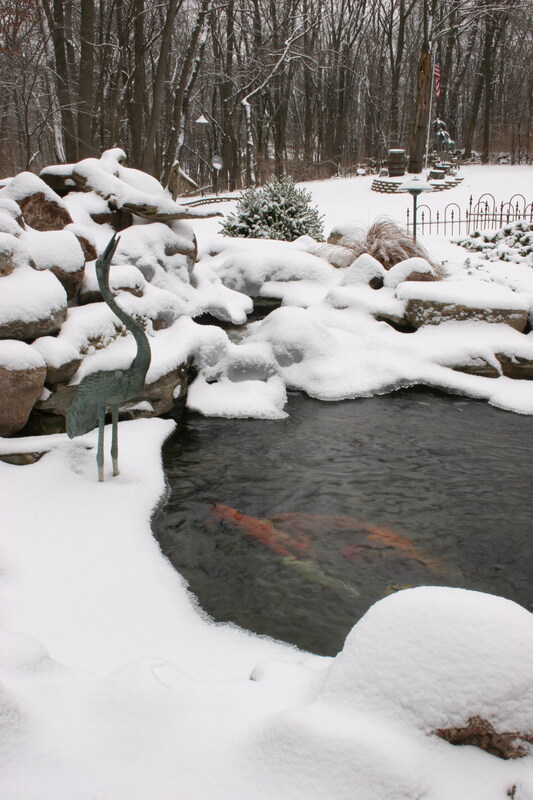 To make your pond or water feature an attractive winter garden keep the following tips in mind. 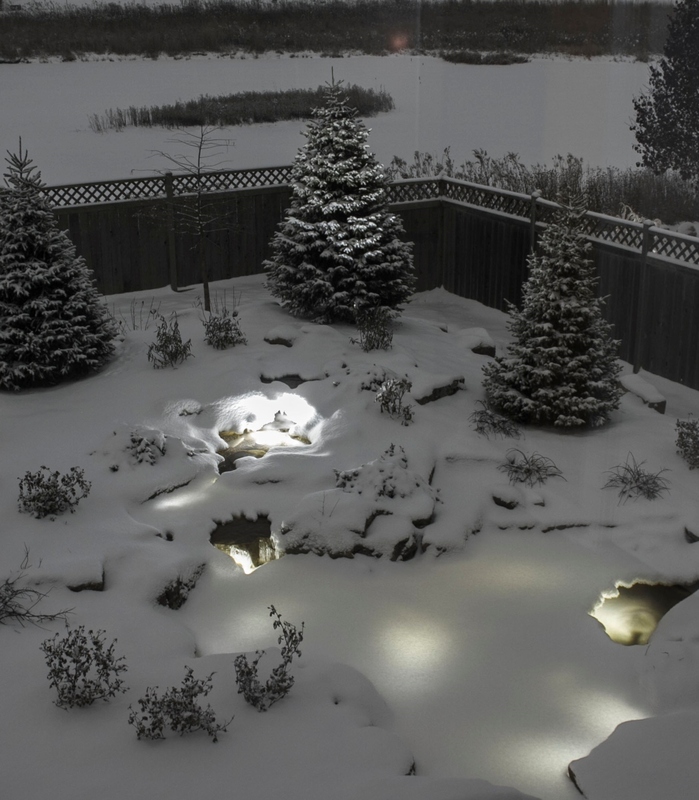 Landscape lighting – a must all year round, but pond lights, water feature lights, or other landscape lighting adds the most visual appeal during the darker winter months. Remove any debris before it has a chance to decompose. Be careful not to turn up the debris; it can turn into bacteria that will be harmful to fish during winter. Use a net. Install a net before too many leaves fall, this will make the job of removing debris a whole lot easier! Prune your plants. Aquatic plants should be pinched off as they die back. If you have perennials around the pond or water feature, this is a good time to remove any dead plant material, and a good time to cut them back if you choose. After a hard frost, tropical plants will die and should be removed, but if you want to enjoy them through the winter bring them inside. Stop feeding fish. Fish go into a type of hibernation stage when water temperatures go down between 55-50F, fish will not digest the food eaten at this point. Use a pond heater and/or aerator. Either devices will add oxygen to the pond, and a heater will keep a hole open in the ice if the waterfall is turned off. Instead of shutting your pond down and reopening again in spring, try to maintain your pond and keep it open all year long. When your pond is paired with seasonal interest landscaping and lights, you will be able to create winter interest, provide water for animals when it can be hard to find in winter, and be able to enjoy your pond all year round!